Versatility is a broad and sometimes vague area to define. In the context of a utility trailer, the necessary (or even desired) trailer options that make it versatile are highly dependent on the intended use. However, when you have a need, choosing the right options will certainly affect how much you like (and use) the trailer. The areas below are intended as items to consider. The desirability and usefulness will depend on individual preferences and your requirements for the trailer. Trailer Size (and size related options) are the obvious first choices. Most size aspects are fundamental parameters that are not usually variable. Length: How long should the trailer be? Longer gives more space for stuff and will make carrying big things easier. On the other hand, longer usually means the trailer is heavier (think slower, lower gas mileage), harder to maneuver (turn corners, park, turn around), and probably cost more. It will also take more room to store. Consider carefully your needs before making this decision. Width: Two big factors are First, legal restrictions; Second what vehicle will be towing the trailer. Ideally, the trailer is roughly the same width as the tow vehicle. That minimizes compensation when turning corners, and your ability to see around it as you drive. If the trailer is quite narrow compared to the tow vehicle, it can be hard to see when backing up. This is not to say any of these are bad, just things to consider. Height: For an enclosed trailer, height is usually the roof height — all over. For other types of trailers, height can include all sorts of things such as hinged tailgates, ladder holders, tool racks, cranes, etc. Or, it can mean the load on a trailer rather than the trailer itself. Pay attention to legal restrictions, and, most importantly, physical restrictions like bridge clearance — or even low tree branches. 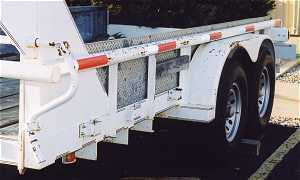 Some choices for trailer height are dictated by access or storage or other outside restrictions. Again, just things to consider. Frontal Area is also a size consideration. How much greater (if any) is the trailer frontal area than the vehicle? If the trailer is wider or taller, then it will impact aerodynamics — thus reducing gas mileage and slowing you down. There are several Capacity Options available. Typical sizes are 1000#, 2000#, 3500#, 5200#, 6000#, 8000# and multiples of these. Others exist. Choose a capacity that meets the requirement. Bigger is not always better, because a 6000# capacity has stiff springs, therefore a harsh ride when lightly loaded. Next are choices for the Number of Axles. Do you choose a single axle? Or double? Or maybe even triple? It all depends on the need. Overall Trailer Size depends on the need. (See your local restrictions on length, height and width if you are considering long, high or wide trailers.) These are trailer options that affect almost everything else. How is the trailer suspended? It’s sometimes overlooked as a trailer option because leaf springs are so common. Actually, the typical leaf springs on pivots are the most common, however, for multi-axle trailers, slipper type leafs are also popular — especially on high capacity trailers. Rubber torsion suspensions also have a following — especially for light duty trailers — because of compactness, and ride. For single axles, torsion axles make good trailer options. or the latitude mounted leaf spring (below). Simple leaves, stacked, with dual eyes (one spring set per side). Typically they come with axles that are straight, or have a 4″ drop. Advantages: These are the most common, and probably the most practical. They minimize stress on the frame because they apply a simple vertical load at 4 distributed points on the frame. They are easy to set-up so the axle position is correct. They are attached with through bolts as simple constraints, and the back shackle is a simple, dynamically stable method of taking up spring deflection. Leaf springs are also the cheapest of suspensions for DIY and for maintenance. Disadvantages: include size, weight, and package constraints (they can take more room under the trailer and sometimes limit how low the bed can be set). Like the leaf springs above, but connected in the center by a rocker link (usually included with an axle kit). Advantages: Like above, but for multiple axles, these springs distribute a simple load fairly well to several points on the frame. This type shares the trailer load reasonably well. Disadvantages: Like above, these take space and pose minor limitations on bed height. Different variations exist, but typically these load share very well, though as a rule, especially over bumps, the “real” trailer capacity is not the sum of the axle capacity — it’s a little less. The rear axle is not as well constrained as the front, so it is arguably less stable, but that does not effect performance in practice. Advantages: There are some packaging advantages, over double-eye leafs, though not much. These are not used very often on single axles because they don’t really have any advantages over the pivot style. However, for multiple axles, they make mounting and load distribution a little easier — particularly with 3 or more axles. In multiple axle applications, especially for high capacity, these are very popular because they load share OK, and have stability advantages. Disadvantages: These systems can be noisy on rough roads because there is a loose spring end that can move. They can also create a lot of wear on the metal parts that rub together. Overall they are designed for it, so it’s not much of a problem. In comparison to pivot springs, for multiple axles, slipper style springs tend to be more stable by virtue of the way the springs are constrained. If we’re picky, it can be argued that slippers do not load share quite as well — meaning the axles don’t each carry the same amount of weight all the time (like over bumps and through dips). In practice, it makes little difference, so making a recommendation that one system is better than another is more a matter of preference — until we get to really heavy trailers where slippers tend to rule. Choose based on need and application. 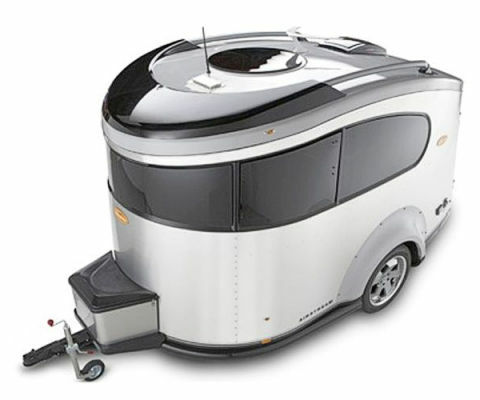 Advantages: These can be very compact and allow additional freedoms in designing the trailer – like low bed height. The elastomer gives some natural damping to the “bumps” in the road, improving ride quality. They are also very nice because each side acts as an independent suspension. Torsion axles are a good choice for light duty trailers — BUT ONLY if the frame design handles the added stresses. Second, Loading to the frame is complex – especially when individual units are used (not tied together side to side) so there are moments in 2 directions along with the vertical loads. Finally, because the “spring” is an elastomer, it has a limited life. Over time (years), the elastomer will gradually harden and crack. When choosing a trailer with Torsion Suspension make sure the frame is well reinforced at the axle mounting location. There are other types like the transverse leafs and coil springs (shown above) that are not widely used because of their limitations or complexity. Coil Springs can be the most compliant (soft) and can have the most travel, but they usually require more complex attachment (like trailing arms) and can be space inefficient under the trailer (vertically). Transverse Leaf Springs are fairly uncommon as they require extra stabilization measures and loading is to the center of the trailer. Walking Beam Suspension are again fairly uncommon for smaller trailers, though we do seem them on high-end semi truck trailers and massive heavy equipment. Read our Case Study on combining the Walking Beam with Twin Torsion Axles for smaller trailers. Axle-Less Suspension is more expensive, but popular in some ways because it combines the benefits of either springs or rubber for suspending, but removes the cross beam. (Actually, it relies on trailer frame cross members instead.) These offer greater ground clearance for the central portion of the trailer, but require more beef in the frame at the suspension location, and careful attention to alignment. Solid Mounting is a bad idea on many levels. We do see it occasionally, often noted by the terrible clanging noises when pulled over even small bumps. These trailers are terrible to pull and susceptible to all sorts of weird failures in tires, bearings, frame parts, etc.. Avoid these completely. I am frequently asked about shock absorbers on trailers. Most trailers do not have them. In general, suspension travel is pretty minimal for most trailers, so shocks don’t actually work that well. If you want a cushioned ride, shocks are great. If a little bouncing is not a bother to the load, shocks are not necessary. Note that shocks will not reduce the bouncing of a nearly empty trailer. Shocks work between the axle and the frame and require motion (compression) to operate. The bouncing of a nearly empty trailer is usually the tires (like bouncing a basketball). To avoid bouncing, reduce tire pressure when the trailer is empty — maybe as low as 15 psi or even 10 psi. The key is using the right suspension for the application. This article cannot cover every possibility, so use the knowledge to choose a suspension that best fits the need. When possible, choose Single Axle Leaf springs. Single axle trailers are easier to maneuver. They are more efficient to pull so fuel efficiency is better for the tow vehicle. Single axle trailers require less maintenance. Applications with a single axle are typically less expensive. Tires are pretty good these days so having extra wheels to compensate for a flat is not a good reason for multiple axles. If the individual axle load rating is 6000# or less, I usually recommend Double-Eye Leaf Springs for load sharing and ride. For heavier ratings 6000# +, and for Many-Axle applications (more than 2 axles) use Slipper Style Leaf Springs for stability. The loads are large — too much for a single axle. The trailer is quite long (with large loads) such that frame stresses are a factor in choosing multiple axles. However, it is usually cheaper and easier to strengthen a long frame than to add axles, so load is really the controlling factor. Choose Torsion Axles when the load is light (2000# or less), and/or when the ride needs additional hystericus or cushy. If you use them, choose a full length axle rather than 2 short ends. The stresses will be less and the wheels will align. Some recommend Torsion Axles for a low bed height. While it is true that torsions do achieve the lowest bed, it isn’t much different than drop axles using low mount hangers. Unless the load is light (< 2000 lbs. ), we suggest you sacrifice a touch on bed height in favor of a more robust suspension. Note: Some people will disagree, which is just fine. There are lots of great trailers that don’t fit these recommendations. Yet, that is just what these are: Recommendations — from experience and an engineering point of view. There are several functional options for Brakes (and whether they’re needed or not). Types of brakes and methods of actuation (electric, hydraulic, applied or surge) are discussed in detail in the Trailer Stability section. Breakaway brake activation can be another nice safety feature. Basically these devices activate the trailer brakes if the breakaway connection comes disconnected. These are used extensively in the rental market, and in more industrial and heavy applications for safety. They do require additional setup, configuration, maintenance and cost. Options for Wheels & Tires abound. Trailer specific wheels and tires are available for most applications, however, automotive components offer some nice benefits. From a functional standpoint, automotive tires offer a better ride and wider availability. Then, for aesthetics, automotive components offer a whole world of options. As with cars, wheels can make the look, so if you want to go in style, get the nice wheels. Just be sure the specs (load, speed, size) match your intended use. For more about tires, see the discussion on Page 2, – Trailer Strength. A Spare Tire. Do you need one? If so, where should it be stored? The picture shows a good idea as a place to keep the spare. Not only is it out of the way, but it’s convenient to check the tire pressure. Comment: Though this image shows a good place to carry a spare, it’s a good idea to keep the spare covered to avoid dry rot from exposure to the sun. How important is a spare tire? Perhaps a better question is … How often are spare tires used? The answers are best with an assessment of the trailer use. If the trailer is rarely used, or stored in the sun where dry-rot can be an issue, it might be really important to have a spare. On the other hand, if you carefully inspect the trailer before use, keep the tires in good shape and have a good road-side assistance program, a spare may not be needed. If it’s possible in your circumstance, a nice idea for efficiency is to have the wheels and tires of the trailer match those of the tow vehicle. That way, if there is a flat, the vehicle spare will accomplish the task for any of the wheels. From a personal standpoint, in all the years I’ve pulled a trailer, I’ve only needed a spare once, and it was the same size as the tow vehicle. I had 2 spares, and wondered why? The Type of Hitch used to pull your load is certainly one of the important trailer options. Normally it’s a given with a particular trailer as to using a bumper type hitch or a gooseneck or a 5th wheel — though I have seen some interesting conversions. In the realm of bumper type hitches (or those that mount at the rear of a vehicle, to include draw-bar styles), there are choices for Ball Hitches (of various sizes and loading capacities), Pintle Hitches, and some other weird stuff. I recommend staying with the standard ball style for “typical” duty, and pintle styles for really heavy duty stuff. Keeping to the standards makes changes much simpler down the road. The option for a Tongue Jack also has options — like whether it has a wheel or not and whether it telescopes or not. 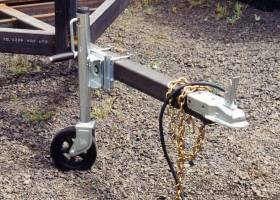 From a functional standpoint, the size of a tongue jack wheel (or plate) will determine how easily the trailer can be moved (off the hitch) on concrete, gravel and/or dirt (or muddy) surfaces. 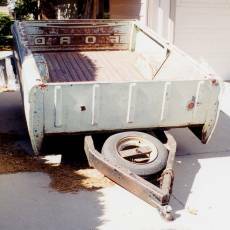 For trailers to be stored on dirt surfaces, a larger tongue jack wheel or plate may be desired. Safety chains are required in most places and are a very good idea. The chains (and chain attachment points on both the trailer and the tow vehicle) must be sized appropriately for the trailer. Obviously a small, light duty trailer needs far less in safety chain than a Caterpillar hauling monster. Choose chains appropriately, and especially the chain length. 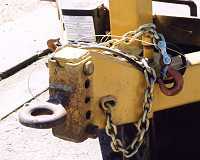 Safety chains should never drag the ground, but they also should not be twisted to shorten them. Yes, some places like U-Haul regularly twist chains for length, but it’s a terrible practice because it weakens the chain. Sides (or not) are obvious trailer options / variations. They come in all different sizes and configurations. Think about your intended use, then choose to add sides or not; then make the sides permanent or removable; and choose solid sides or perhaps slatted, tall or short. There are lots of possibilities. For the creative, the sky is the limit. Here is one remodel where the bed and sides extend beyond the wheels. Obviously that changes stability some! So, when doing customization, be careful that you don’t hurt the strength, stability or tow-ability of the trailer. If you choose sides, you may also want a Trailer Top. The top can be canvas, or hard; it may be permanent or removable. A top may lift to gain access or it may be stationary. One item of particular importance to consider with a top is the weather. What will the trailer carry? Is water an issue? Where and how will the trailer be stored? For some trailers, like utility trailers, a Tail Gate (or not) is an option to consider. As pictured in some of the images here, there are many types of tailgates — and they can be made of various materials. Some gates just hold stuff in. While others fold down to become a rear ramp for access into the trailer. Some are solid, and some are open for wind to pass through. Ramps are a popular option. Sometimes the ramp is really the tailgate that folds down (like in the wood slat sides image above). Other times the ramps are purpose built for motorcycles or ATV’s, or perhaps a “store under” variety like on some of our trailers. Let your needs dictate the type of ramp. A good usability option that is often overlooked at the time of purchase is that of tie-down points. These are especially important with open utility trailers. Sometimes the tie points are part of the frame, sometimes attached to the sides. Sometimes they are rigid; sometimes they fold away. Generally, for utility trailers, more tie-down points are better. Round bars on the trailer sides make great tie points all along. Tie points should be in convenient locations based on the intended use, or (as in most of our designs) have adjustable positioning. Dedicated tie points for specific loads (like motorcycles or ATV’s) must be strong enough to hold the item in place. That brings up the next item — Fenders. There are all sorts of fenders available from stamped steel to plastic, fiberglass or wood. They come square, rounded or as pasture fenders. Mostly they do the same job, so looks and taste are the big reasons for consideration. Fender strength may be a consideration if you are planning to use them as a step, or as place to stand. Also, your state or province may regulate the need (and size) for fenders. For trailers that are frequently in use, and for those that have a specific purpose (like snowmobiles, ATV’s, work trailers, etc.) space for storage is one of those trailer options that really increase utility and convenience. 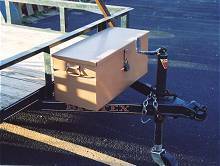 Added Storage compartments like the tongue box in the picture can make a nice addition to a trailer. As with this box, a nice weather tight (and/or secure) place to put tools, tie-downs and other items can be very useful. depends on the specific application, and what you need to store. Other trailer options for storage include space under the trailer for ramps, a place for batteries, a water tank, or specific tools that stay with the trailer. The storage space can be built in, or purchased and attached like the box. Storage space as a tray to place a cooler or other removable containers is also an option. That way the container is not permanently mounted. Aerodynamic Additions as trailer options are also worth mentioning again. The functional aspects are discussed on the Trailer Stability page. Yet, there are many aerodynamic options and add-ons to improve the look as well as the function. Many enclosed trailers have pointed noses, or rounded corners. Although these options increase work in the building process, and cost more when purchasing, they are worth a bunch if you travel a lot. Aerodynamic improvements are (almost) like free fuel, and they improve stability at speed. Any improvement that decreases drag also improves fuel mileage of the tow vehicle. Depending on the situation, 1-5 mpg improvement is not out of the question. One of the easiest improvements is to simply cover the bottom of the trailer frame so it is smooth from tip to tail. It can be done with something stiff and light — like Coroplast or thin sheet metal. Just make sure it does not seal completely to trap water inside. Decreasing turbulence created under the trailer decreases both noise and drag. And, from the outside you don’t see it. Or, you can get extreme and buy one that is full aero. So far we have discussed mostly direct trailer options. Yet, there are also versatility options to protect your trailer. Storage is one of the worst situations for a trailer. So many are just set outside, Yet the easiest protection is a simple a cover. It can be a tarp, or something a little more robust. Tipping the trailer up (or down) so water runs off. Either way, keeping your trailer out of the elements — even if just a little — will drastically improve serviceability. Tires won’t dry rot as fast. Rust won’t be as drastic. Wood decks last much longer. Lights don’t need as much repair. And the list goes on. While towing, mud flaps on the tow vehicle will give some protection to your trailer. If you’re towing a boat or something valuable like that, keeping it protected from road debris is important. This option from Rock Tamers is great. It connects to the draw bar so it comes on/off with the ball. It also has many adjustments to make it fit. Finally, every designer has some nifty trailer options available with their product. Some we have done are the movable (adjustable) axles, and a removable tongue. 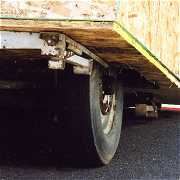 The movable axle allows the trailer to be flexible to loading needs. The removable tongue allows the trailer to be stored in a much tighter space. Look around at trailers you may see on the road. Many are just stock from the factory, but even some of those have cool trailer options added. When you see something clever that you like, take a photo to remember it. Trailer options are mostly a matter of taste and need – and perhaps a matter of what things work with in a particular design. Several typical options for both safety and utility are listed here for reference and consideration, but the sky’s the limit. Personally, I think customizing with options that improve utility and function is awesome. Make the trailer unique. Make it yours. Build your own, and make it personal! Build a Great Trailer with Engineered Blueprints that have the design principles.